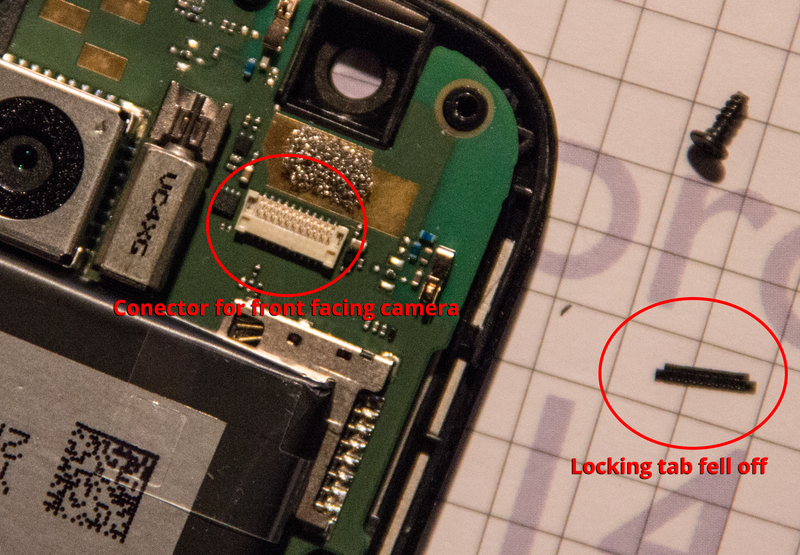 While trying to replace my Motorola Moto G screen, I had to disconnect the front facing camera. Unfortunately, the locking tab came loose. I don't have any idea how to fix this... Could anyone help me? I fixed the problem myself just by using Scotch tape. I didn't really tape the connector to the port to keep it in place, but I put 3 small layers of Scotch tape on top of the connector. Then I inserted the connector. It's not really easy to insert the connector because it got thicker, but that's the reason why it works: the thickness of the connector with the Scotch tape "simulates" the pressure of the locking tab. TL;DR: put small pieces of tape on top of connector, then insert connector. Test front camera and add layer of tape if necessary until you reach suffising pressure. Excuse me for my English and good luck to anyone with the same problem :) feel free to contact me if something isn't clear. I have had this happen a couple of times. As long as the tabs on either side of the "door" (black plastic piece that came loose) are intact and not broken off you can somewhat easily re-insert it. Try placing the door at a 90 degree angle and then gently swing it into place. Be careful not to bend the pins in the onboard connector though. Thanks! How can I see which side needs to be facing the pins and which side needs to be facing up? Should be evident when you inspect the door. both sides will appear different. One should have obvious fluting that will seat around the pins on the connector. I really can't get it in there though... Is there any way I could make it work without the lock? Possibly by taping the connection. I definitely would not suggest it though. The door will go back on. As long as it is not damaged it just takes a little perseverance. Wouter 가/이 대단히 고마워 할 것입니다.